NSIDC: Arctic Sea Ice Melt Season – latest start on record | Wott's Up With That? 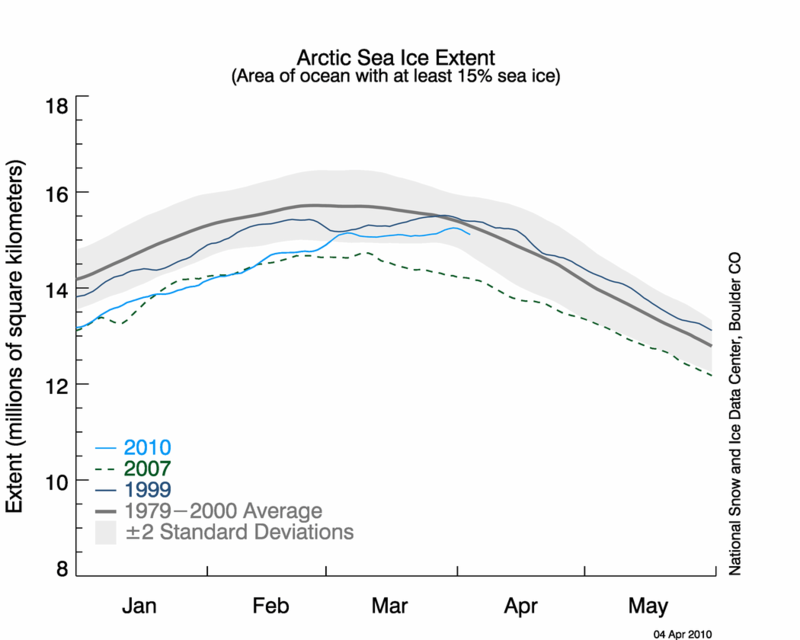 “NSIDC: Arctic Sea Ice Melt Season – latest start on record“. Anthony Watts feints amnesia to infer that an NSIDC Sea Ice News report called “Cold snap causes late-season growth spurt” means that a cold Arctic winter has disproved Global Warming. Remember why this is the latest start on record, Anthony? We both posted about it two days ago. Sugar, you're goin' down. Source: NSIDC. This entry was posted in Just Keep Saying It, Misdirection and tagged Sea ice by Ben. Bookmark the permalink. um…the latest start on record? I take it that the little line on the chart representing 2010 being below the 1979-2000 average is not important? Oh I understand how denialists work. They will search endlessly for some little kernel of truth that supports their cause and then totally ignore everything else. When that kernel disappears they start a new search. Sorta like buying a used car. The thing’s a pile of junk but one headlight works therefore it just simply must be a great car.